Nowadays all animated messages are a great way to communicate a specific message. In a world that moves so fast, people try to spend less time trying to guess what publicity is trying to say. So by creating beautiful animations and using fewer words, going directly to the point will help your business get noticed. It’s all about high-quality animations, interesting interactions between images or videos, and an awesome music track. You’ll have a winner, dynamic slideshow video. The most practical way to get your message out there is to be direct and short. If you make long messages, people could get bored or not have enough time to read it before the slide changes. The trick here is to support the text by using images that could wrap up the final message. You can find images on stock websites. Make sure to pick those your audience will feel empathy with, and if you can add good pictures from your library, it will be fantastic. Why? Because this is the proof your audience may need to feel convinced that you are speaking the truth. But on the other hand, if you have a low-quality picture or video, avoid using it. Even if it has accurate information, bad quality will always subtract professionalism from your hard work. Don’t worry about hiring a professional studio to make a successful slideshow video. Nowadays there are plenty of online tools to create them. The most important thing is using effective storytelling that will make your audience feel what you’re sharing with them to the point of inspiration with great potential for taking action after seeing it. For advertisement purposes, 2 minutes or less is fine. For presentations, 5 minutes is enough time for all the necessary information. For project pitches like elevator pitches, 20 to 30 seconds or max 3 minutes. If you’re wondering how to improve your storytelling skills, the best advice out there for an effective presentation is from Garr Reynolds. Learn how to do this with this cheat sheet. Where Can I Use My Slideshow Video? 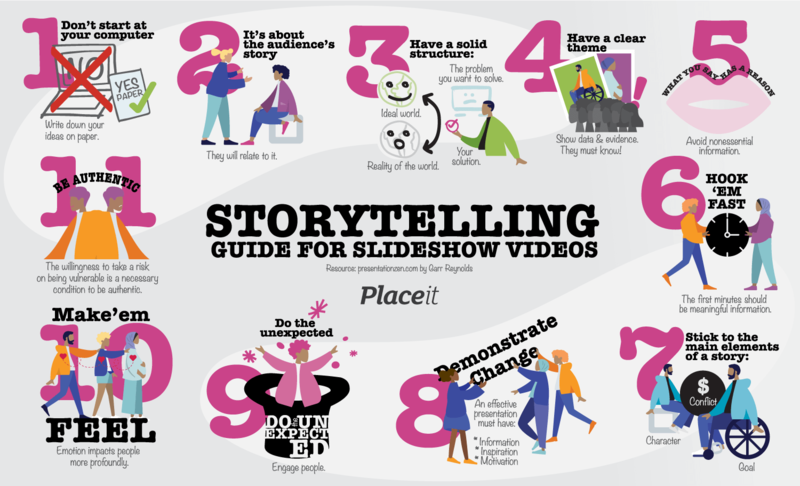 There are many uses for your slideshow videos, not only talks and presentations. Once you have your file, there are many opportunities for you to apply it. Upload it as a welcome video to your website’s homepage, add it to your monthly newsletter or even uploading it your social media networks is a great idea. Facebook, Instagram, and even Twitter can be interesting channels to inform and reach other customers. So make sure you make it exciting and most of all fill it with useful information. There are so many boring slideshows out there, and sometimes people forget that this communication tool has three things in common with a talk: you need to inspire, inform and motivate your audience to take action. So making them outstanding is a must for a successful overcome. Placeit is an incredible online design tool you can use to create professional slideshow videos and amazing images for your business. Build your brand and professional assets. Your designs will look amazing on both desktop and mobile for only $29 USD a month. Get full access to all the design templates, logos, videos, and mockups. Create eye-catching slideshow videos for any presentation or another important event related to your business. 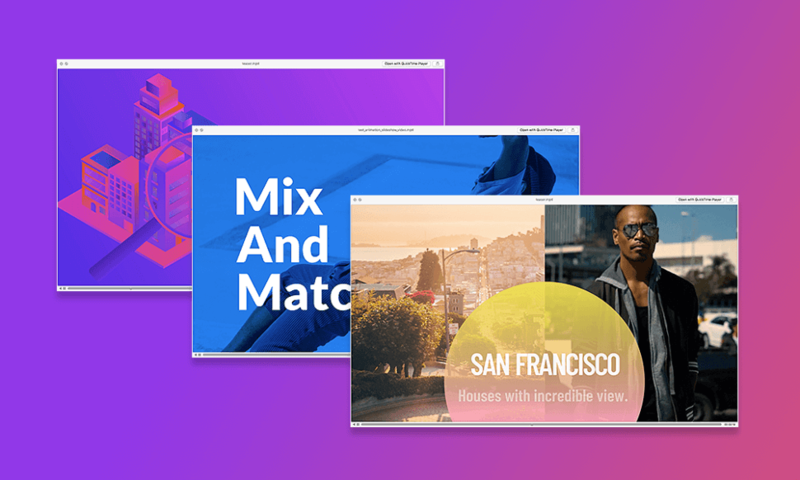 With Placeit's Slideshow Video Maker you can create amazing videos in minutes or refresh your brand with our logo maker, design templates and mockups. Create your own Slideshow Video!